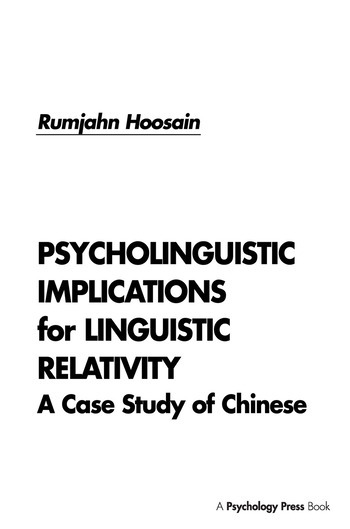 Rather than offering variations in "world view" as evidence for linguistic relativity, this book views language related differences in terms of the facility with which information is processed. Distinctive perceptual, memory, and neurolinguistic aspects of the Chinese language are discussed, as is the cognitive style of the Chinese people. Chinese orthography and other features of morphology and syntax are examined in relation to both bottom-up and top-down cognitive processes. While providing an extensive review of the experimental literature published in English on the Chinese language, this volume also offers a significant sample of the literature originally published in Chinese. Contents: Introduction. Aspects of the Chinese Language. Perceptual Aspects of the Chinese Language. Memory Aspects of the Chinese Language. Neurolinguistic Aspects of the Chinese Language. Conclusion. "...the book has many practical discussions as well as useful references to the literature that is not easily accessible to non-Chinese readers, and the author made a fine effort to clarify a number of common misconceptions about the language. Thus, overall, this book makes a valuable contribution to an area where the needs far outstrip available texts. The issues dealt with in this book should be of interest and concern to professionals in psycholinguistics, cognitive psychology, and cross-cultural psychology." "...a valuable contribution to the scholarly body of literature that could profitably be read by linguists, psychologists, speech and language pathologists, and professionals in allied areas."